Home The FOLIO Features: Who is Your Mona Lisa? Leonardo da Vinci’s Mona Lisa stands among the most recognized works of art across the globe and is arguably his most widely-known piece. To discover what some of today’s leading artists think, or hope, will be their most recognized work, we asked “Who is your Mona Lisa? And why?” Here’s what they shared regarding their most iconic pieces to date. 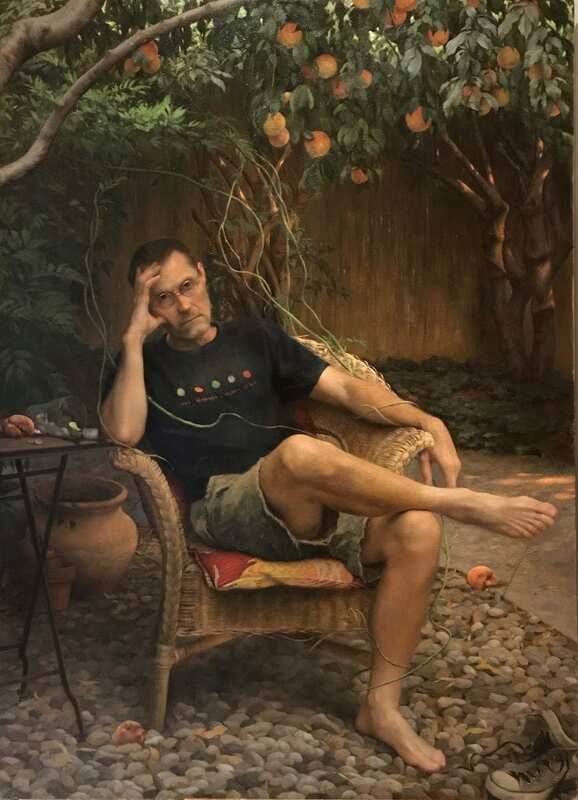 Realist figurative and landscape painter, Kamille Corry, feels her most iconic work is The Reluctant Genius (Portrait of John), a portrait of Corry’s closest friend. Corry has infused personal symbolism with whimsical, surreal elements such as the wisteria vines entwined around the model. For Corry, the painting marks a new level of technical ability, including the capacity to design and execute the composition quickly. Further, she says, “It has always been a strong desire of mine to paint the figure outdoors—which is challenging—and this painting is the most successful one I’ve done outdoors.” Corry does not use reference photographs. All her work is done from life, memory and conception, making the challenges of this type of painting even more difficult. 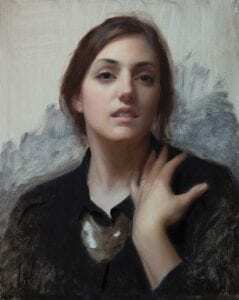 The Reluctant Genius has been selected for the semi-final round of the most prestigious portrait show in the U.S.—the Outwin Boochever Portrait Competition at the National Gallery at the Smithsonian in Washington, D.C. She is excited and hopeful about the prospect of being chosen for the final round. Almost 92 at the time of this painting, Ruggeberg grew up farming corn in Iowa alongside his ten siblings. In Spring Corn, Frantzen contrasts Ruggeberg’s past life, filled with family, with his present one of solitude. The piece marks Frantzen’s willingness to leave the comfort zone of having a subject and scene from which to paint. She used her mind’s eye and life references as conduits to convey her vision. Although she had tried throughout her career to use this methodology, she now sees that sticking with this seemingly painful exercise has worked. Spring Corn was purchased for the Figge Art Museum collection, is featured in the Art Renewal Center, and was awarded the PoetsArtists Award. 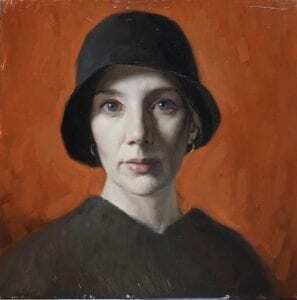 Hernes reflects that the self-portrait marks a moment of a major move that has had great impact on her work and life. For Hernes, this work captures a time in her life when her past and present experiences—living in both the Swedish countryside and Florence while being visually influenced by the urban environment and intensity of New York—produced a painting that echoed her previous work. She reflects that the self-portrait marks a moment of a major move that has had great impact on her work and life. Also, it was created in midlife when she was becoming more set, determined, and enriched by different experiences. This particular self-portrait was painted during the winter: “It was cold in my studio, so I had a warm poncho on. The black hat has a small brim which blocks light from raking across my eyes, and keeps hair from my face while painting.” Hernes feels the strong visual impact of the painting is due to the contrast of the red background with the blue of the eyes, and sets off the cool chroma of the skin. The flash of yellow gold in the earrings completes the primary color trio in her composition. She reflects that the intense, fiery background frames the face, and the visible brush work provides an abstract, textured counterpart to the smooth rendering of the skin. 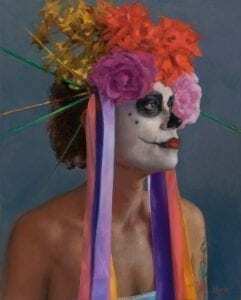 Self-Portrait with Black Hat was first exhibited at the Florence Academy of Art Gallery at Mana Contemporary in Jersey City. It was then featured in International Artist Magazine. The painting sold while being exhibited at the Face Value exhibit in London. A student of Nelson Shanks for many years, Italiano helped found Studio Incamminati. She recalls that being part of such a strong tradition and environment required that at some point she pull away from working strictly from life and studio set-ups. This painting was part of her process of pulling away, and self-actualization wherein she used the skills learned working from life over many years to suit her needs, and express her vision. Remembrance was featured in the exhibit, Nelson Shanks and His Influence: Past, Present and Future, at Stanek Gallery in 2017. The piece was also featured in Lea Colie Wight’s new book, Foundations of Classical Oil Painting. A portrait of the artist’s wife, Laura in Black, is Joshua LaRock’s most iconic piece to date, and the one with which he is most satisfied. LaRock says that the portrait taught him about the importance of emotional content in a work of art. Laura in Black is LaRock’s most critically acclaimed and widely exhibited work to date. 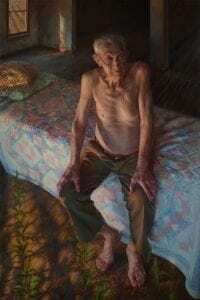 It was selected for exhibit in the prestigious BP Portrait Award in 2016 at the National Portrait Gallery in London, before touring three other venues in the U.K. The National Gallery chose the piece to grace the cover of their What’s On catalogue that summer. Additionally, the Art Renewal Center awarded Laura in Black a Purchase Award for their 12th International Salon. It was shown at the Salmagundi Club in NYC, and then sent back to Europe to hang at the MEAM in Barcelona. It is now in the ARC permanent collection.